Lot’s of holidays have become staples on the running calendar. The Turkey Trot leads the way—after all, most of us have a choice of races come Thanksgiving to help burn (or pre-burn, if that’s a thing) holiday calories. The 4th of July has its share of races, along with St. Patrick’s Day, Memorial Day, and Labor Day, although without much of a themed tie-in. Valentine’s Day comes at a rough time of year for runners in the Chicago area. 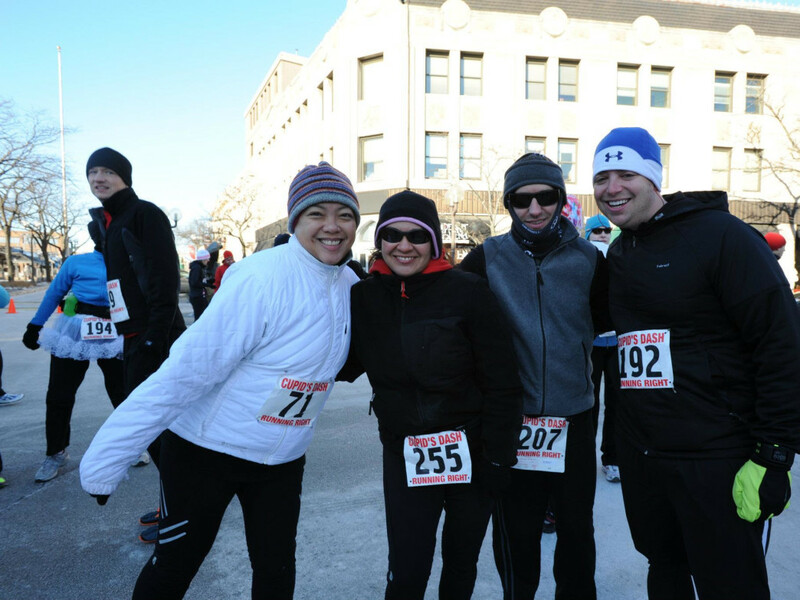 With the weather so hit-and-miss on February 14, there traditionally have not been more than a couple of fun runs to celebrate the holiday. But that’s changing. Maybe we’re getting tougher, but more and more events are targeting winter as at time to put yourself to the test—or at least have fun—by running through the inclement weather. And that means more Valentine’s themed events. If you really want to put that toughness to the test, the Cupid’s Undie Run on February 7 offers more than a physical challenge—you have to be willing to run in your skivvies. Well, at least some version of your skivvies. Yes, you’ll certainly find the hard-bodies out in force in the barely-there to help raise money for the Children’s Tumor Foundation. But really, you can dress in whatever makes you comfortable. The untimed run starts at John Barleycorn in Chicago, making a one-mile loop back to the bar, where the party begins. Last year more than 600 participants braved the cold in the inaugural event, and this year, event organizers can accommodate up to 1,000. Race-day registration will be available if that number isn’t met before Feb. 7. Runners who prefer to run in, you know, running gear, have several other options as well. Fleet Feet Sports in Chicago has a bit of a match-making reputation to begin with—at least 22 couples have gotten married as a result of meeting at one of their fun runs. So it makes sense that the running store would celebrate the holiday in a unique way—its Valentine’s Day Fun Run on Feb. 13 at the Old Town location features a smart way to meet other people. Each runner receives a free pair of Nathan Sports reflective snap bands, which will mark your relationship status. You can meet other singles looking for a love connection or simply some new people to run with. It’s a fun run, so run as far as you like (most go 2-5 miles) and end up back at the store for food and drinks. Saucony is sponsoring the event, and will be there offering samples of their new natural running line to wear-test. And if you don’t find a sole-mate (sorry) at the run, a match-maker from Stef and the City will be at the post-run party to talk about finding romance. Or if love isn’t on your mind, you can consult with a personal trainer about tips for better health in 2015. If you’re looking for a more traditional run, the 5th annual Cupid’s Love Dash in Highland Park on February 8 offers a 5K race through the streets of the northern suburb. In the spirit of the holiday, it offers a two person team competition. Sign up with your significant other, or running partner, to compete against other teams in the male/female, female/female and male/male categories. Awards are given to the top three teams based on cumulative running team. Or you can run by yourself in the solo category, with awards also going to the top three males and females. The event benefits Wings, a charity for homeless and abused women and children, and runners are encouraged to bring canned goods to donate. After all, you want to make sure you have good Karma on Valentine’s Day.